FORT WORTH, Texas (Sept. 10, 2014) – The Davey O’Brien National Quarterback Award Marquee Matchups for week three of the college football season feature a showdown between top-25 Southeastern Conference rivals (South Carolina at Georgia), a clash between a pair of Texas natives playing quarterback for out-of-state schools (East Carolina at Virginia Tech) and a Friday night shootout between two high-powered offenses (Baylor at Buffalo). 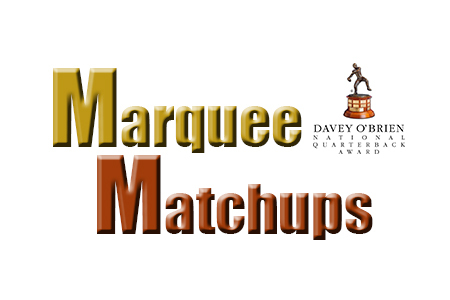 Throughout the season, the Davey O’Brien Award will highlight the best weekly quarterback matchups as the race for the oldest and most prestigious national quarterback award continues. Quarterbacks from all 128 NCAA Division I Football Bowl Subdivision schools are eligible for the award until the field is narrowed to 16 semifinalists on Monday, Nov. 3. Hutson Mason, a member of the preseason watch list, helped direct the Bulldogs past Clemson in Georgia’s lone game this season. The senior scored a rushing touchdown and completed 18-of-26 passes in the 45-21 win. Senior Dylan Thompson has thrown for 632 yards and five scores for the 1-1 Gamecocks. Highlighting that total was a 366-yard, four-touchdown performance against Texas A&M in the opener. Through two games, Shane Carden is 58-for-83 passing (69.9 percent) for 604 yards and four touchdowns for the Pirates (1-1), who are averaging 37.5 points per game. The senior appeared on this year’s preseason watch list. Michael Brewer helped lead his Hokies to an upset victory at then-No. 8 Ohio State last week. The transfer from Texas Tech has totaled 450 yards passing and four touchdowns for Virginia Tech (2-0). Honors candidate Bryce Petty of Baylor returns after missing one game due to injury. An award semifinalist in 2013, the senior accounted for three touchdowns (2 passing, 1 rushing) in just one half in the Bears’ opener. Buffalo’s Joe Licata is currently among the NCAA’s leaders in touchdown passes (T-1st, 8) and passing yards (10th, 694). The junior has helped the Bulls (1-1) average 38.5 points through two contests.